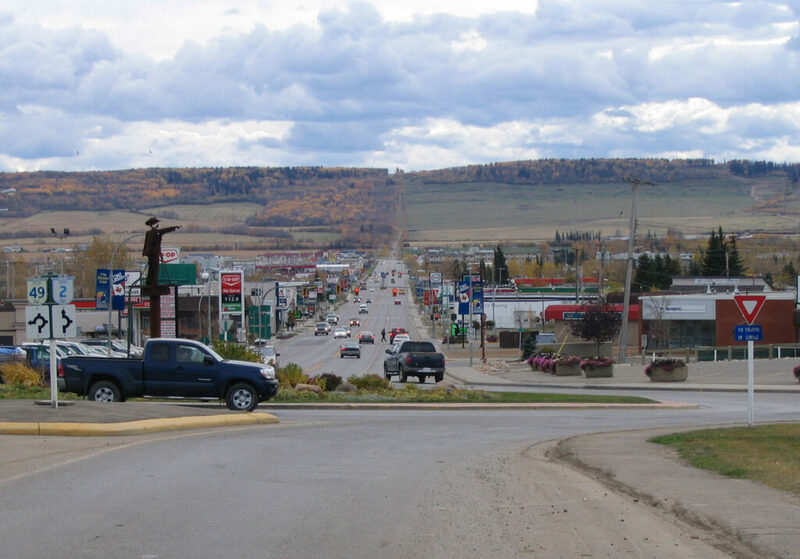 Dawson Creek is a small town in British Columbia, Canada that is best known as being “Mile 0” of the Alaska Highway. For those adventuring by road to Alaska, the Alaska Highway (or AlCan) is the only road to Alaska, crossing through British Columbia and the Yukon Territory before entering Alaska. If you are traveling from the lower 48, getting to the START of the Alaska Highway can be an adventure, and the community of Dawson Creek is a place to pause and celebrate. Located at the confluence of the Dawson Creek and the Pouce Coupe River, Dawson Creek was initially a farming community, but quickly became a hub of BC transportation. In the early 1930s, the Northern Alberta Railroad had a terminus at Dawson Creek to support the construction of the Alaska Highway. The town quickly became a hub for road and rail travel through the Canadian Rocky Mountains. Oil and gas reserves discovered in the surrounding area and the wind farm south of town have brought an energy economy to the area in recent years. 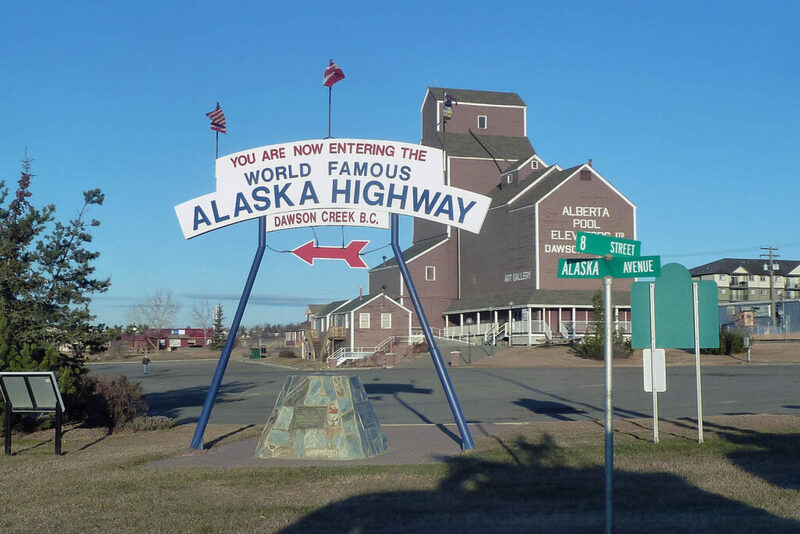 Dawson Creek is also a good place to gear up for the less populated miles ahead on the Alaska Highway. Amenities such as grocery stores, medical services, and mechanics may not be readily available further down the Alaska Highway. While in town, there are some fantastic attractions that offer a look into the the area’s history, natural beauty, and resources. Waterfowl Refuge at McQueen’s Slough. For birders and photographers, this area offers abundant opportunity to view birds and waterfowl nesting and migrating through the area. The slough is northeast of Dawson Creek and includes boardwalks around the perimeter to allow visitor access. Radar Lake Community Forest and Bear Mountain. Winter and summer recreational opportunities including snowmobiling, Nordic skiing, small craft boating, and hiking are available at Radar Lake and Bear Mountain. It’s also a great place to birdwatch—spotted hermit thrushes, western tanagers, and many other species have been spotted. Alaska Highway House Museum. Learn about the history and engineering challenges of building the Alaska Highway at this little museum. Plan to spend some time to watch the film and give yourself a greater appreciation of the road miles that lie ahead. Fishing at nearby waterways. Dawson Creek is surrounded by many lakes, rivers, and streams that are fishable throughout the year. Whether you prefer fishing from a lake shore or river bank, Dolly Varden, Burbot, Grayling, Trout, Perch, and Northern Pike are just a few of the fish species that might grab your hook. Some of the more popular fishing locals include Dawson Creek, Dinosaur Lake, Moose Lake, and the Wolverine River. Ice fishing is popular during the winter months as well. Explore Tumbler Ridge Geopark. About an hour south of Dawson Creek, Tumbler Ridge offers abundant trails for exploring the wilderness of British Columbia. Several new trails have been added to allow hikers to explore the wilderness. Waterfalls, fossils, and over 3,000 years of anthropological resources give a wide variety of things to discover. The Tumbler Ridge Geopark is recognized as a UNESCO Global Geopark. Annual events like the Pioneer Village Jamboree (late June), the Mile 0 Cruisers Cruise & Shine (mid-July), and the Dawson Creek Rodeo & Parade (August) will add extra local flavor to your visit. There are several established campgrounds in the Dawson Creek area that are RV-friendly and include various amenities. Since the summer months bring many travelers through the Alaska Highway, calling ahead for reservations is recommended. We spent several days here on our way to Alaska and on our way back. It was very enjoyable. The NAR was built to transport grain from the wheat farms of the Peace River Bloc (no K) AKA the Peace River Region of British Columbia and the Grand Prairie area of Alberta. The, reason that the Alaska Highway started at Dawson Creek was because the NAR was all ready there. How do I know that? I spent the better part of the 1960s in YDQ as manager of the airline that serviced that area. Great city and and area which my wife and I will be visiting this summer as we will be doing “The Highway” as it was known as when I lived there. One big change will be PAVEMENT. When I last drove it it was mud, which was an improvement over Dust, dust that never seemed to settle.